Experience the magic of a Greek sunset on this romantic 2-hour cruise from Mykonos. 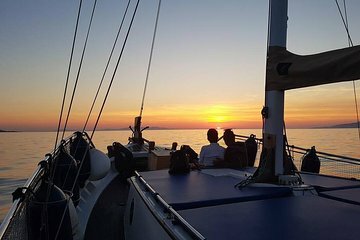 Set sail across the Aegean Sea; take in spectacular views of Delos island, Rhenia, and Little Venice; and enjoy drinks and snacks as you watch the sunset from deck. Hotel pickup and drop-off is included. Cannot give less than a 1 star, or I would. Trip was not a cruise. It was in an old rounded, wooden fishing boat that could seat about 6 on the rear deck. Simple cheese plate with wine from a 2 litter drink bottle. Since it was windy we could not even motor outside the New Harbor without being thrown about. After motoring back and forth in the New Harbor for an hour all 6 of us asked to be returned to shore. Little Venice and Delos were impossible and could never be seen at our speed, even in good weather. Trip was a joke. Viator, as the on line booking agent, is as much to blame as the vendor as people rely on Viator to check-out these tours. Obviously they are also only interested in the money. I would like to begin with, the gentleman captaining the boat were great - but weather conditions should have led to the tour being cancelled. There were 20-30 MPH winds, with gusts up to 50 MPH throughout the day. We had our hotel contact the company and they said the tour was not cancelled so we went to the dock assuming that because the winds had decreased to about 15 MPH, that they would not impact the trip. Unfortunately the captain could not go further than 500 feet from the shore and the boat only traveled up and down the coast from Old Port to New Port several times. The waves rocked the boat so much that one of the passengers had to hold on to the snacks provided the whole time or they would have fallen off of the table. After the third trip the group decided to request the boat just return to dock. The boat was unable to make it to Little Venice or Delos Island. My suggestion is do not book unless you are sure that the weather is not going to be poor. We also had the unfortunate experience that it was cloudy so we could not see the sunset. Do not miss this lovely evening with this delightful young couple!